What Kind of Job Are You Doing? The type of job you plan on doing will play a huge part in the type of plow you chose. Generally, if you are plowing a heavy amount of sidewalks, which are very narrow, you’re going to want a smaller plow. You’ll want a plow that will clean the entire area without going over the edge of the sidewalk. BOSS offers a four foot ATV plow that is ideal for sidewalk use. Wider UTV snow plows are more equipped for residential, short driveways. If you are looking to plow more rugged terrain, such as a long camp drive, you might want to consider a v-plow as it can more easily break trail and cut through ice. As noted above, the type of job you’re doing is going to help determine the plow you get. Odds are, it has already also determined the type of machine you have. If you’re on a municipal snow removal team, you’re probably got, or are going to want, a heated UTV cab for many hours on the job. With the larger UTV, your options for a snowplow will be different than those of an ATV. Generally, the bigger the machine, the bigger a plow you can use with it. Once again, if you’re doing a lot of sidewalk work, you’ll probably have an ATV which means you’ll want a smaller, narrower plow. There’s no doubt, both plows are tough. Straight blades are very popular as they are generally lighter and less expensive. However, the V-plow can handle snow in a very different way than the straight blade. Because of the arrowhead configuration of the V-plow it can slice through frozen snow more readily than a straight blade. Stacking snow is also a tad different, as you can put the V-plow into scoop mode and direct exactly where the snow will go. There are three main types of lift systems that are available for ATV or UTV plows: manual, winch or direct lift. A manual or winch lift systems may be fine if you only have one or two homes or jobs to do. Both of these options will require you to manually angle the plow left, right or straight, and with the manual lift system, as its name states, you will have to raise and lower the blade by hand. If you are a medium to large sized contractor or municipal team with a sidewalk crew, you will want to consider a direct lift hydraulic plow. By having the hydraulic system, it eliminates the need to get off of the machine to angle or lift the blade. This makes a usually cumbersome job faster and easier to do. It also minimizes the risk of slipping on the ice as it reduces the time off of the machine. There are two options to choose from when it comes to the different plow materials: steel and poly. Both materials are tough and up for the job, however, there are typically two schools of thought when it comes to choosing a plow material: the slick, corrosion resistant quality that poly has and the rigidity and durability of steel. Snow and slush will slide off of a poly blade with ease and a steel blade provides excellent value while providing a durable, rigid blade to slice through snow. Again, both materials are up for the task and BOSS offers various commercial grade snowplow applications in both materials. You should always consider ease of use when picking out any snowplow. If the plow isn’t going to be easy to attach or control, you won’t enjoy working with it very much. You should watch for the type of attachment system that the plow utilizes. If the plow is hydraulic, you should be mindful of the type of controller it is equipped with. BOSS offers the easy to use, RT3 attachment system for select plows. The SmartTouch 2 controller is available for all UTV applications and BOSS’s ATV controller feature an easily accessible handlebar mounted controller. You should also look into whether the hydraulics are standard or are an additional package to add to your plow. 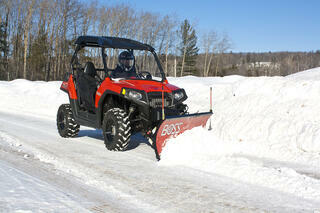 BOSS offers fully hydraulic lift and angling standard on each of its ATV and UTV plows. One major aspect to consider when adding a plow to your ATV or UTV is the changing of the seasons. Most likely, you’ll want your ATV or UTV to be trail compatible again come summer. When purchasing a snowplow, look at the undercarriage and whether you’ll have to remove it during the warm months of the year. All of BOSS’s applications offer exceptional ground clearance so that in most circumstances you won’t have to remove the undercarriage at all during spring and summer and can still ride the trails with ease. There are numerous uses for ATV and UTV plows, from residential driveways to municipal sidewalks all the way to personal use for camp or cottage drives. When you go out to purchase an ATV or UTV snowplow, remember to keep these areas of focus in mind.